The lights go down, the curtains go up and the microphone turns on. At a concert it’s a sign that the show is about to begin. In a pub or bar it can often mean karaoke will ensue. In any case it typically means the fun and enjoyment of music is ready to sound off. 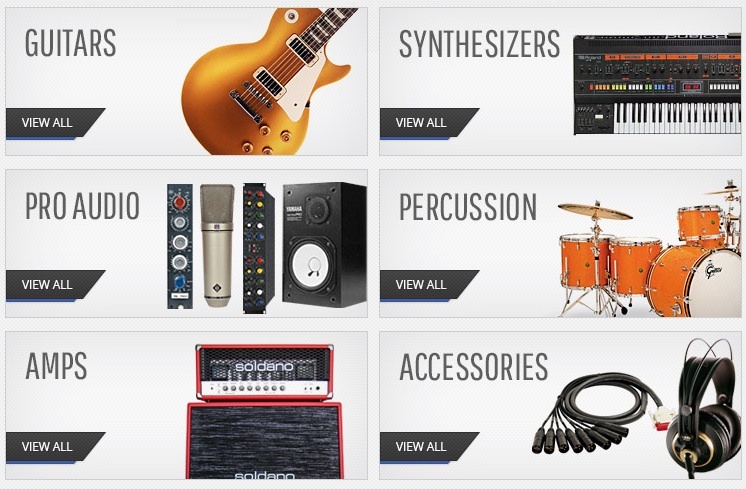 Techno Empire specializes in selling products to musicians and music enthusiasts. The shop is fully equipped to provide the necessities to bands and vocal artists and now the shop is ready to simplify the shopping process. The store recently collaborated with OC Designs Online and together they came up with a custom eBay store design. Everything is in tune for the perfect shopping experience! The header of this eBay shop design sets the vibe for the store. The store name and logo lies center stage with the headline introducing the store’s specialty: Alluring Instruments and Pro Audio Gear. Below the store name and headline shoppers can see a charcoal grey information panel. Here they have easy access to testimonials, customer support and store policies. There’s even a customized tab for selling gear to the shop! A wider and more prominent panel lies directly beneath highlighting perks with shopping at Techno Empire. Hassle free returns and a satisfaction guarantee are just two of the benefits at shopping with the eBay store! The midsection to this eBay store design categorizes the shop for the shopper! Each store category tab has a clear label of the products, a visual of the category and a tab titled, “View All.” The tab directs customers to the desired products of interest and enables easy browsing of store inventory. The experts at OC Designs Online know the importance of clear images and visuals since online shoppers are visual shoppers! The footer of this eBay shop design is for placing products in the spotlight. The featured products section allows Techno Empire to place whatever products they like directly in front of online shoppers. It’s the perfect area to highlight new inventory, showcase sale items or introduce customers to things they may easily overlook! A price along with a tab to view the product are found directly at the bottom! Come browse our eBay templates for an eye catching design. The attention to detail, ease of browsing and ability to customize for any affair can’t be found anywhere else at such an affordable price. Take a moment to browse our portfolio and request a free quote. You’ll like what you see!